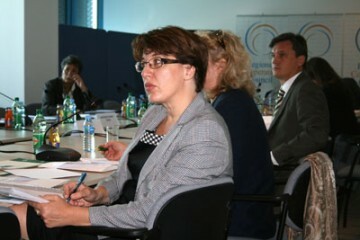 Sarajevo – Secretary General of the Regional Cooperation Council, Majlinda Bregu, for the first time since the inception of the duty, chaired the meeting of the organisation’s Board at the RCC Secretariat offices in Sarajevo, yesterday. 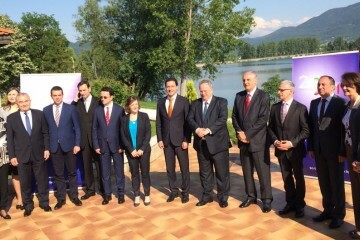 Sarajevo – Majlinda Bregu, Secretary General of the Regional Cooperation Council (RCC) paid an official visit to Milorad Dodik, Chairman of the Bosnia and Herzegovina Presidency, in Sarajevo today. 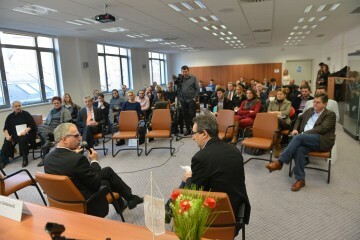 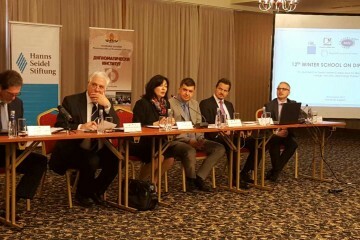 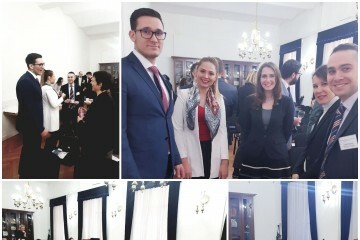 Sarajevo – The Regional Cooperation Council, in cooperation with the Ministry of Foreign Affairs of Bosnia and Herzegovina, organized training for the region’s young diplomats from South East Europe, in Sarajevo today. 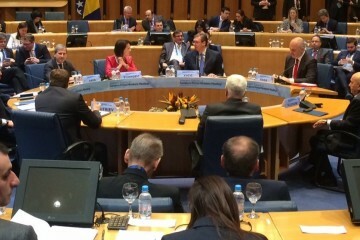 Podgorica - Majlinda Bregu, Secretary General of the Regional Cooperation Council (RCC) started her consultations in Podgorica today by meeting Milo Đukanović, President of Montenegro. 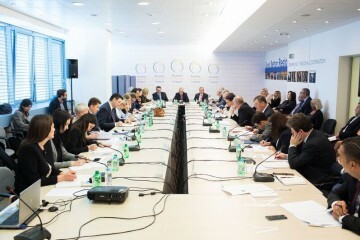 Sarajevo – The Board of the Regional Cooperation Council (RCC) met for the 35th time at the organisations’ Secretariat in Sarajevo, Bosnia and Herzegovina today. 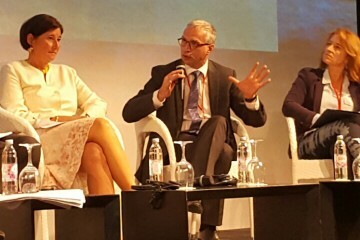 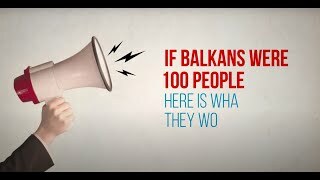 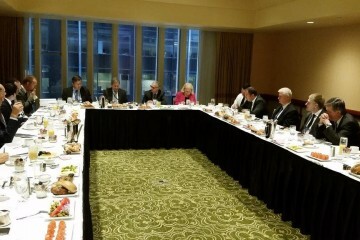 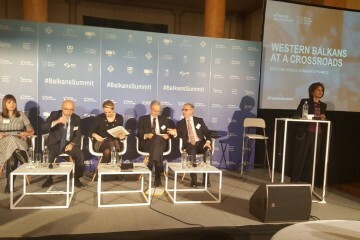 The Secretary General of the regional Cooperation Council (RCC), Goran Svilanovic, took part at the Western Balkans (WB) Summit on 10 July in London. 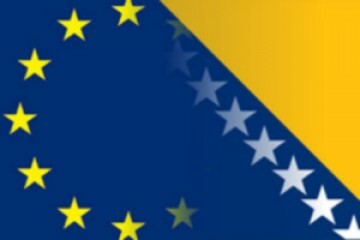 Banja Luka – The Secretary General of the Regional Cooperation Council (RCC), Goran Svilanovic, met the Foreign Minister of Bosnia and Herzegovina, Igor Crnadak, in Banja Luka today. 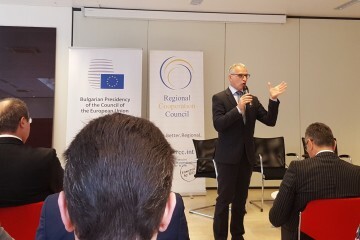 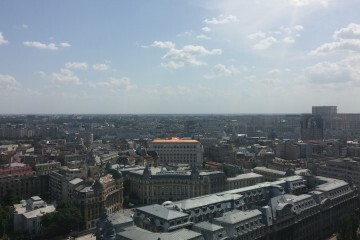 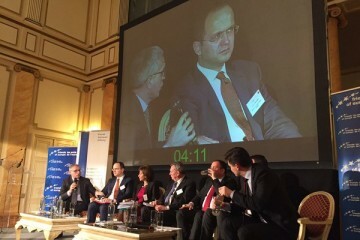 Brussels - Bulgarian Presidency of the Council of the European Union together with the Regional Cooperation Council (RCC) hosted a conference on the Western Balkans’ European perspective through growth, good governance and enhanced cooperation, in Brussels today. 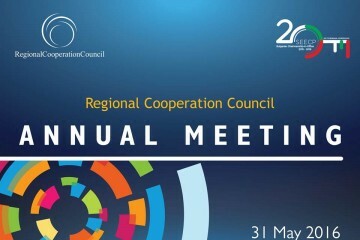 Brdo pri Kranju – The 10th Annual Meeting of the Regional Cooperation Council (RCC), held in Brdo pri Kranju today, endorsed the RCC Annual Report 2017/2018 and the nominations of Majlinda Bregu as the next RCC Secretary General for the term 2019-2021 and Igor Luksic for the term 2022-2024. 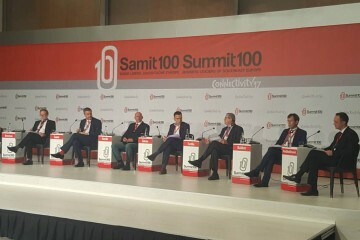 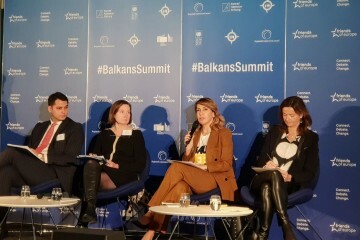 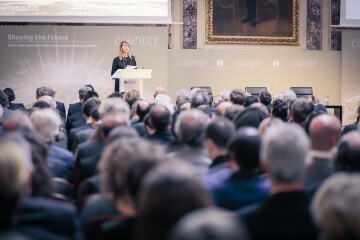 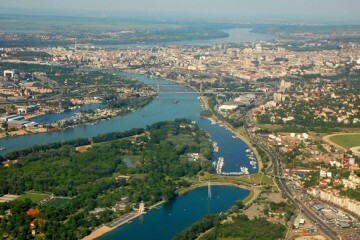 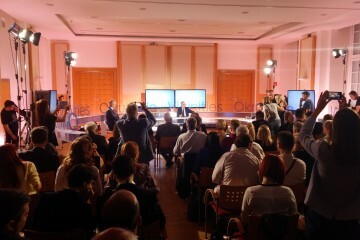 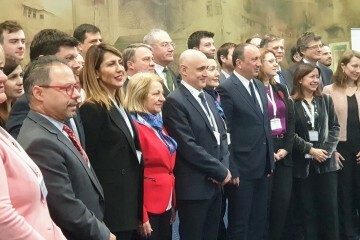 Skopje – The 6th Business leaders’ Summit100, focusing on connectivity, discussing transport, free trade, infrastructure, branding and promotion of the region, mobility of people, as well as energy and digital agendas, kicked off in Skopje today. 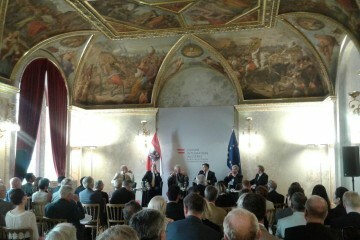 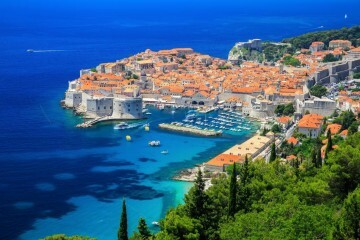 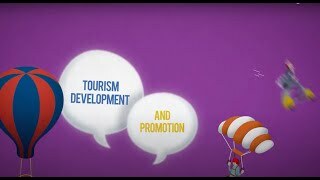 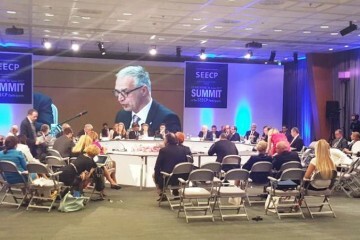 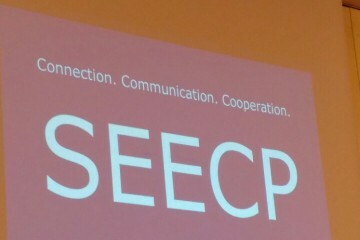 Dubrovnik - Annual Report of the Regional Cooperation Council (RCC) 2016/2017 was endorsed by the South-East European Cooperation Process (SEECP) Ministers of Foreign Affairs and consecutively by the Heads of State and Government at the meetings held in Dubrovnik today. 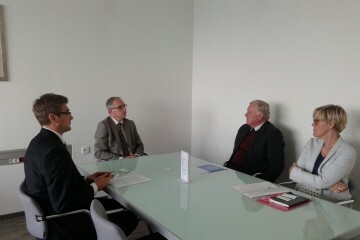 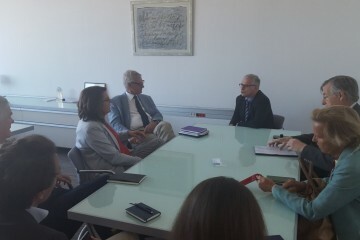 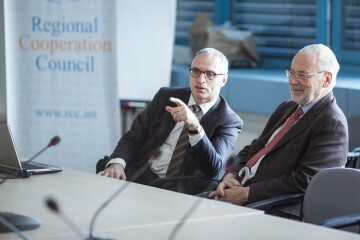 Sarajevo – Erhard Busek, former Special Co-ordinator of the Stability Pact for South Eastern Europe, predecessor of the Regional Cooperation Council (RCC) visited RCC’s Secretariat in Sarajevo today. 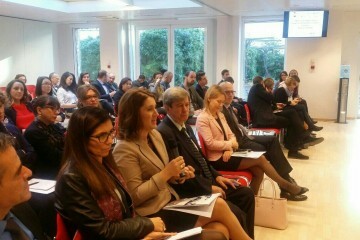 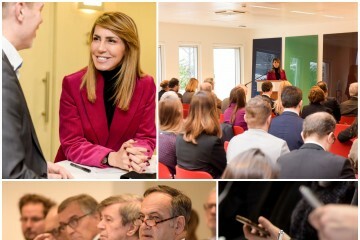 The Regional Cooperation Council (RCC) Liaison Office in Brussels hosted today the official EU launch of the Advocacy Strategy for the EU Integration of the Western Balkans, an event organized by the European Movement International in collaboration with the RCC. 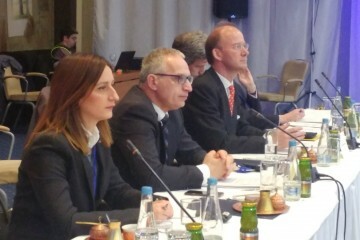 Secretary General of the Regional Cooperation Council (RCC) Goran Svilanovic participated today at the regional Milocer Development Forum in Cetinje (Montenegro) where he presented some of the specific RCC contributions towards strengthening sustainable development in the region. 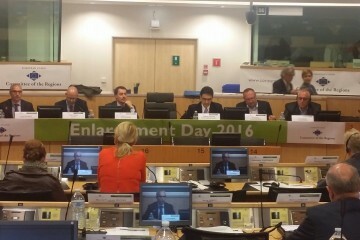 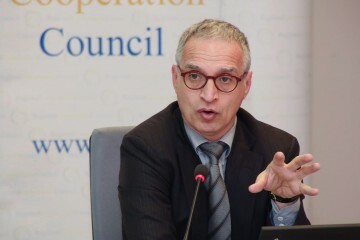 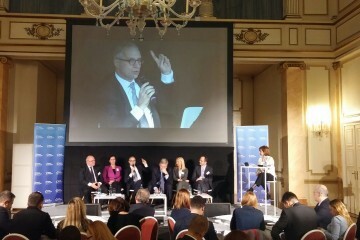 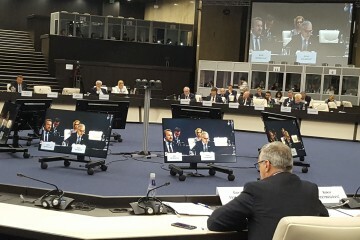 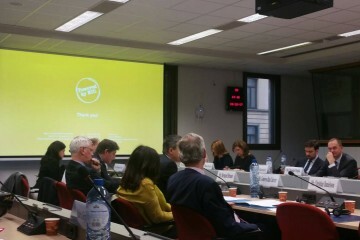 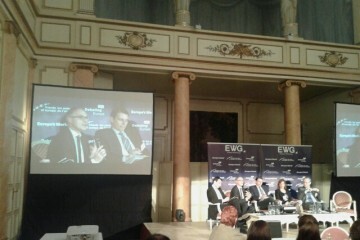 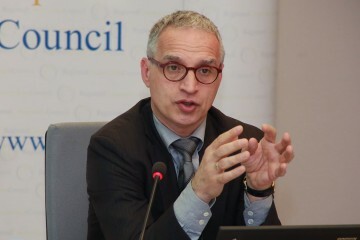 The Secretary General of the Regional Cooperation Council (RCC), Goran Svilanovic, took part at the Enlargement Day, organised by the European Committee of the Regions in cooperation with DG Neighbourhood and Enlargement Negotiations of the European Commission, in Brussels today. 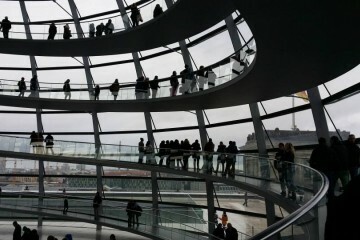 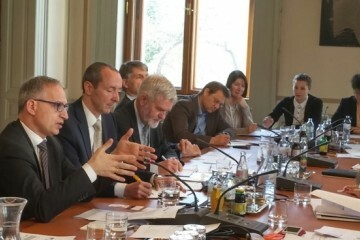 Members of the German Parliament (Bundestag) from the Social Democratic Party (SDP) have said that the role of the Regional Cooperation Council (RCC) and the Central European Free Trade Agreement (CEFTA) have to be strengthened. 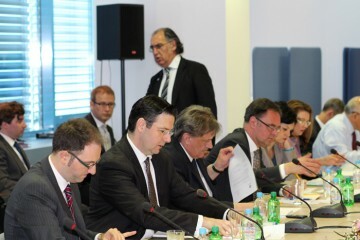 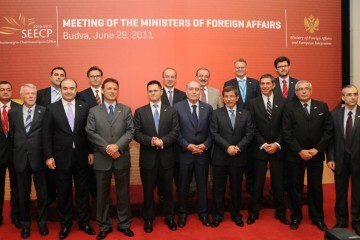 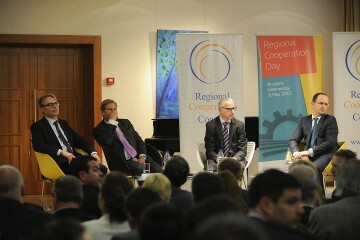 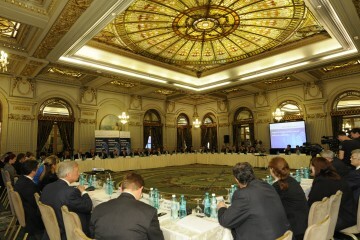 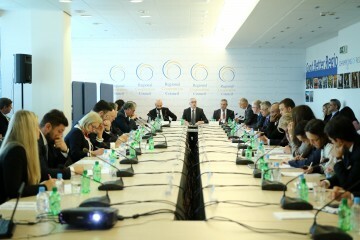 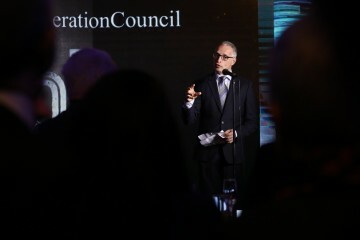 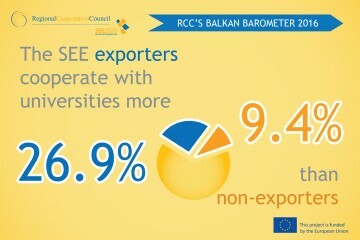 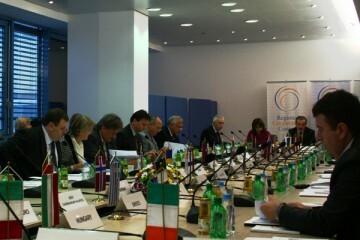 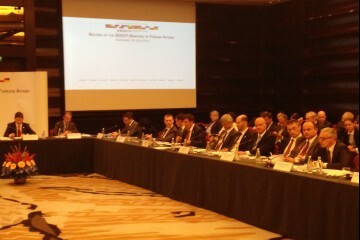 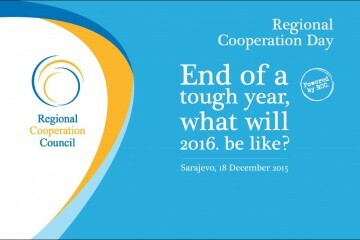 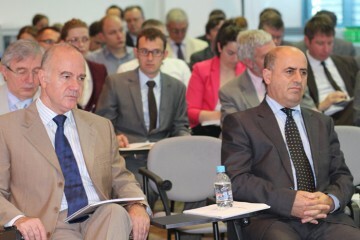 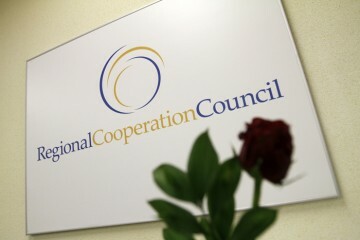 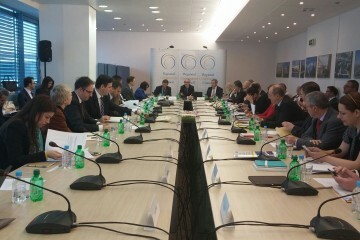 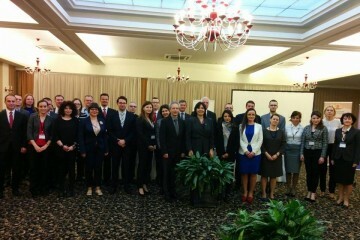 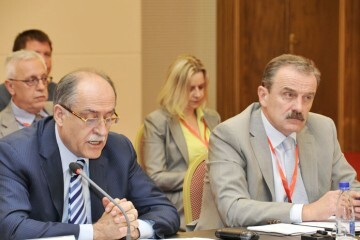 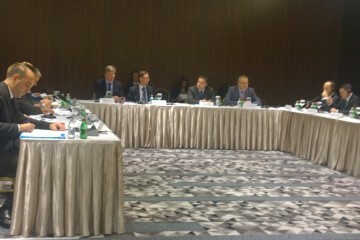 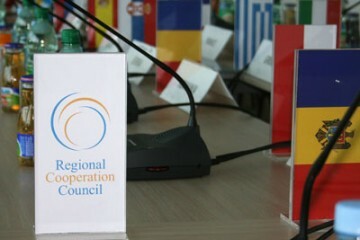 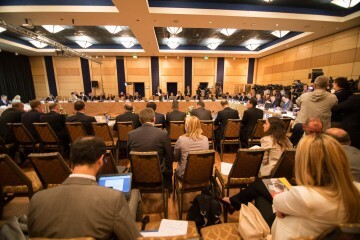 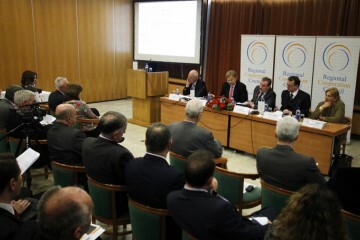 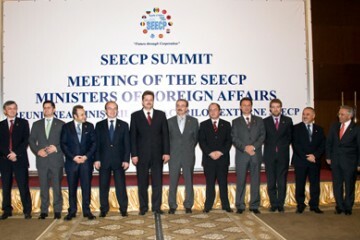 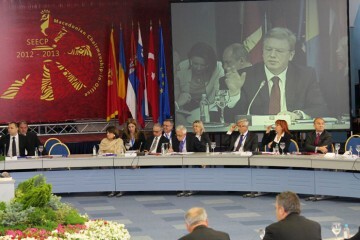 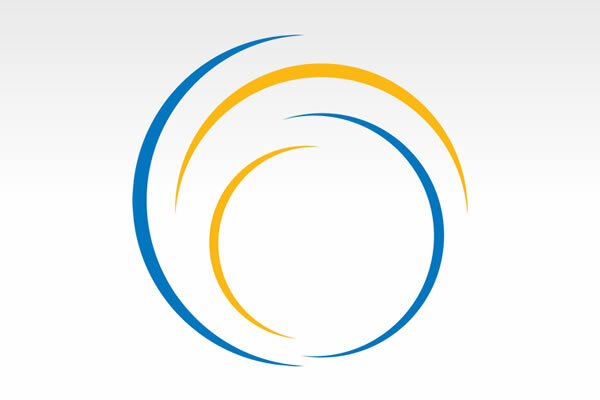 Sarajevo – The 28th meeting of the Regional Cooperation Council (RCC) Board took place in Sarajevo today. 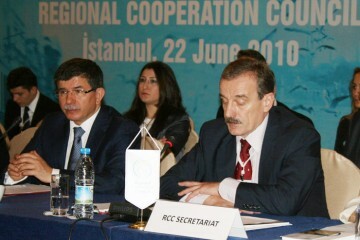 RCC Secretary General, Goran Svilanovic, presented the activities of the RCC Secretariat since October 2015 and the Board accepted them. 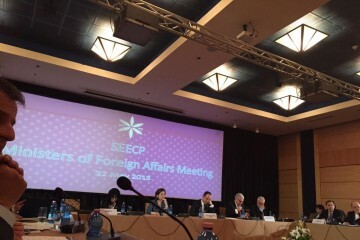 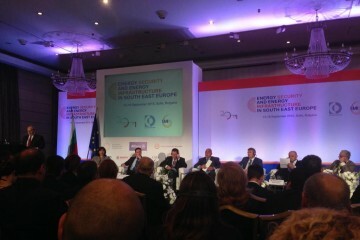 Regional Cooperation Council (RCC) Secretary General Goran Svilanovic attended today’s meeting of Political Directors of the South-East European Cooperation Process (SEECP), the first organised by the current Chair-in-Office, Bulgaria. 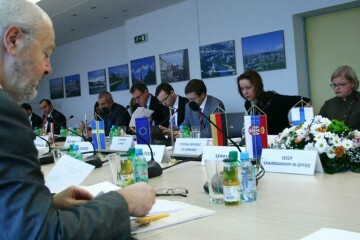 Vienna/Sarajevo, 29 October 2015 - Ways and means for better cooperation between the Organisation for Security and Cooperation in Europe (OSCE) and the Regional Cooperation Council (RCC) were discussed today at a meeting of the OSCE Permanent Council in Vienna. 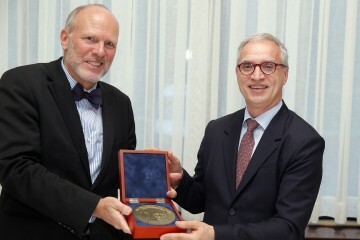 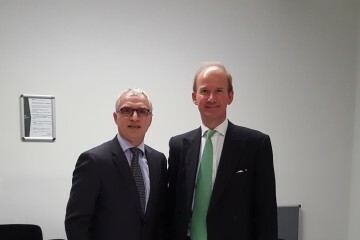 Regional Cooperation Council’s (RCC), Secretary General, Goran Svilanovic, received today the Swedish Ambassador to Bosnia and Herzegovina, Fredrik Schiller. 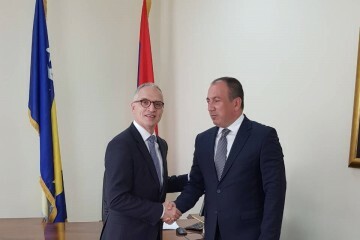 The Secretary General of the Regional Cooperation Council (RCC), Goran Svilanovic, met today in Sarajevo with the Minister of Foreign Affairs of Bosnia and Herzegovina, Igor Crnadak. 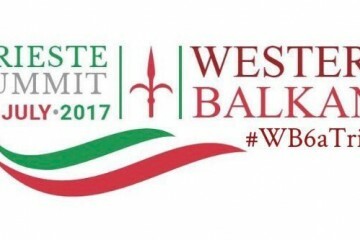 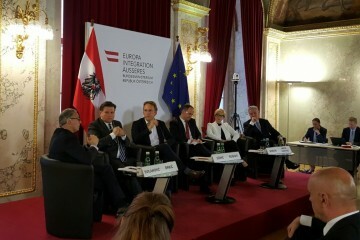 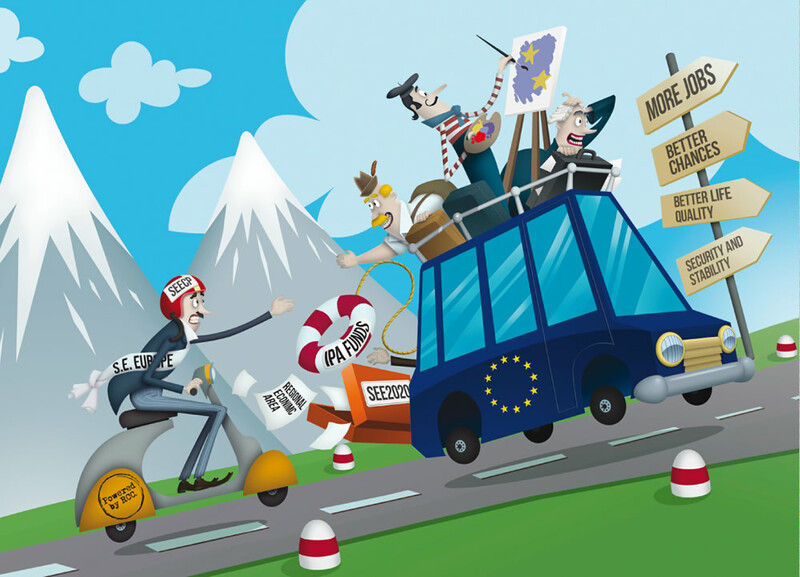 The margins of last Thursday’s Vienna summit of the WB6 leaders and the leaders of the Berlin Process countries and the EU, were rich with events in the days preceding and following the actual Summit. 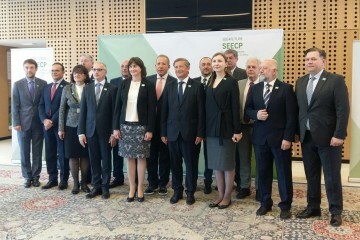 Secretary General of the Regional Cooperation Council (RCC) Goran Svilanovic met today with the Ambassadors of SEECP participants accredited to EU and NATO in Brussels as well as with EC Director General Christian Danielsson. 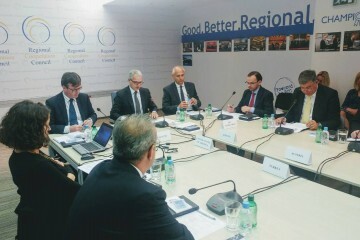 The Board of the Regional Cooperation council met in Sarajevo today ahead of the Annual meeting which will take place in Tirana, later this month. 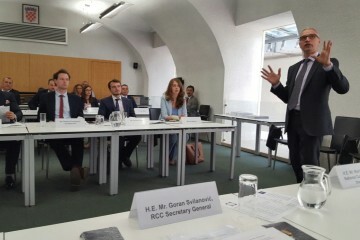 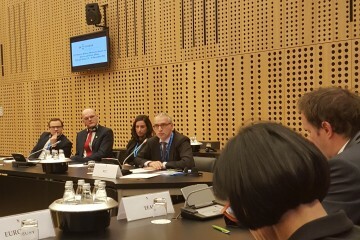 The Regional Cooperation Council (RCC) Secretary General, Goran Svilanovic, briefed Austrian parliamentarians today on the implementation of the SEE2020 Strategy, RCC’s primary instrument for boosting growth and jobs in the region’s economies. 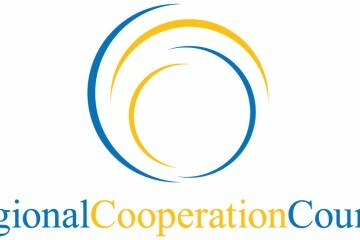 A kick-start to stalled accession? 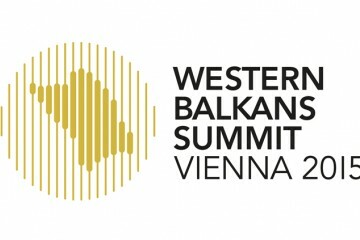 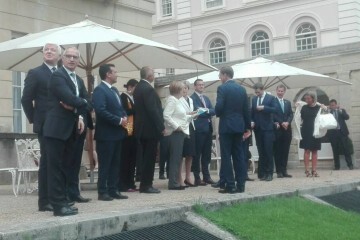 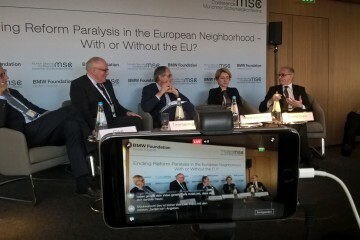 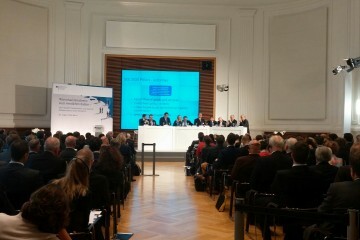 BERLIN – At the initiative of German Chancellor Angela Merkel and hosted by Vice Chancellor and Minister for Economic Affairs and Energy, Sigmar Gabriel, a discussion on economic potentials and prospects of the Western Balkans kicked off the Western Balkans summit in Berlin. 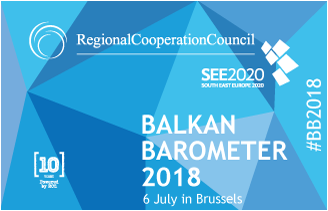 Agreement on 50,000 euro grant to support public awareness activities of the Regional Cooperation Council (RCC) Secretariat in 2014 was signed by the RCC Secretary General, Goran Svilanovic and German Ambassador to Bosnia and Herzegovina, Ulrike Knotz in Sarajevo today. 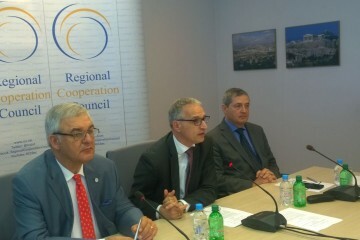 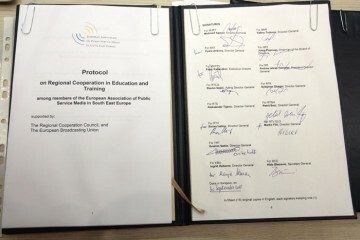 A 3,575,000 euro grant agreement supporting activities of the Regional Cooperation Council (RCC) Secretariat in 2014 was signed today in Brussels between the European Commission (EC) and the Regional Cooperation Council (RCC). 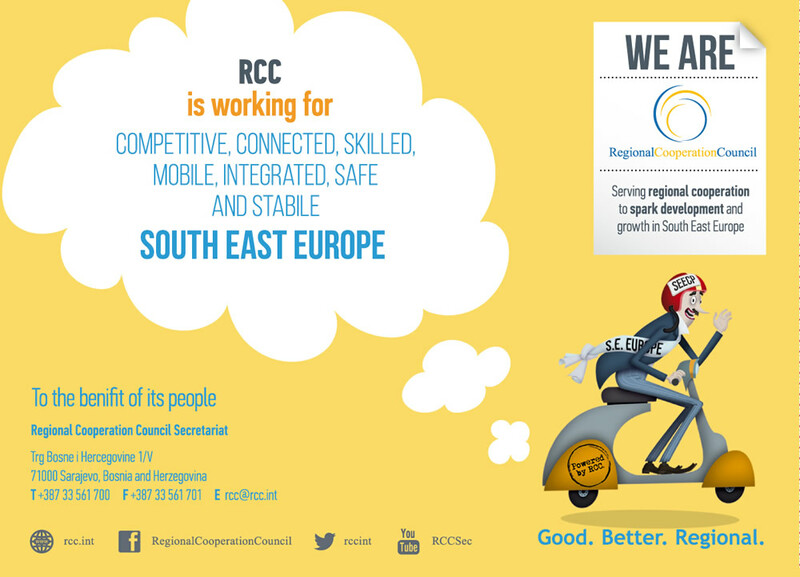 The Regional Cooperation Council (RCC) Board adopted today the RCC Strategy and Work Programme 2014-2016, centred around implementation of the South East Europe 2020 (SEE 2020) strategy, as the organization's contribution to overcoming economic crisis in the region. 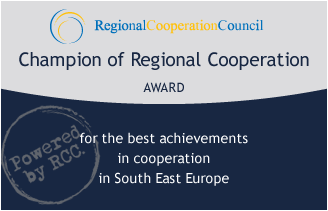 A 50,000 euro grant agreement supporting activities of the Regional Cooperation Council (RCC) Secretariat in 2013 was signed by Goran Svilanovic, RCC Secretary General, and Ulrike Knotz, German Ambassador to Bosnia and Herzegovina, in Sarajevo today. 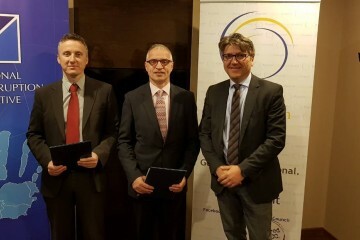 The Regional Cooperation Council (RCC) Secretary General, Hido Biscevic, and German Ambassador to Bosnia and Herzegovina, Ulrike Knotz, signed in Sarajevo today a 50,000 euro grant agreement in support of the work of the RCC Secretariat in 2012. 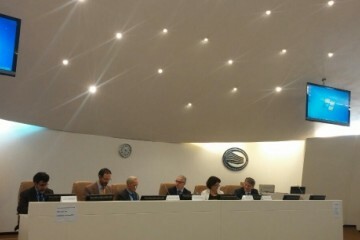 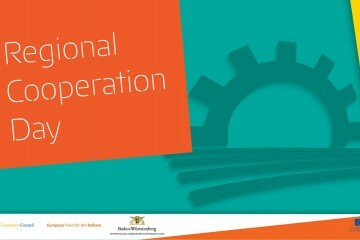 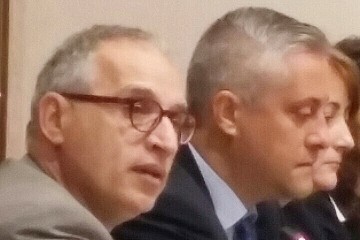 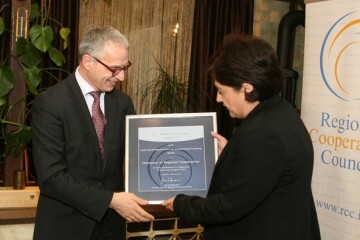 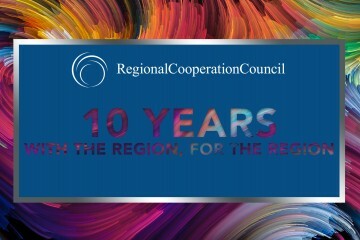 The second meeting of the Regional Cooperation Council (RCC) Board in 2012 accepted today the Annual Report 2011-2012 of the organization’s Secretary General. 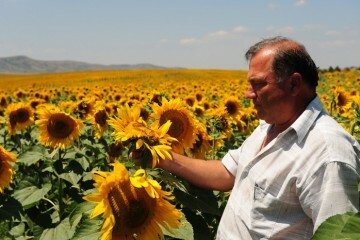 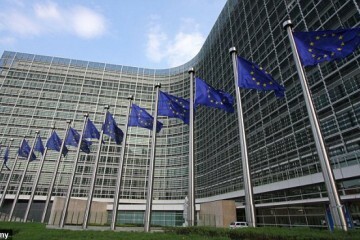 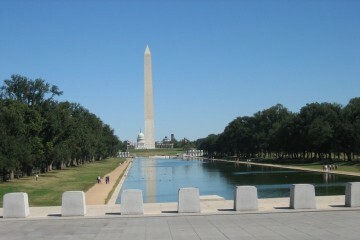 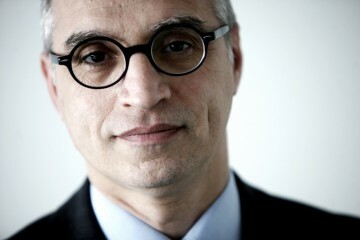 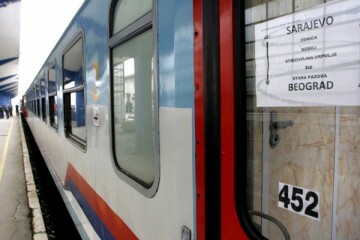 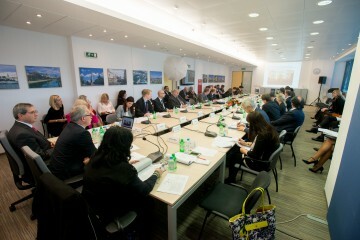 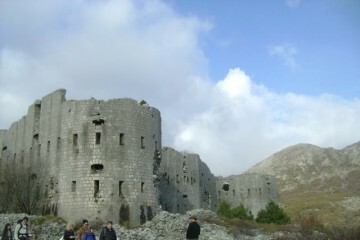 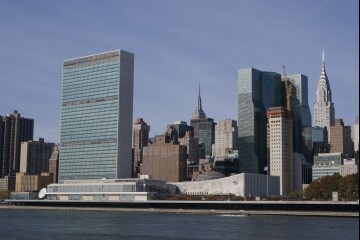 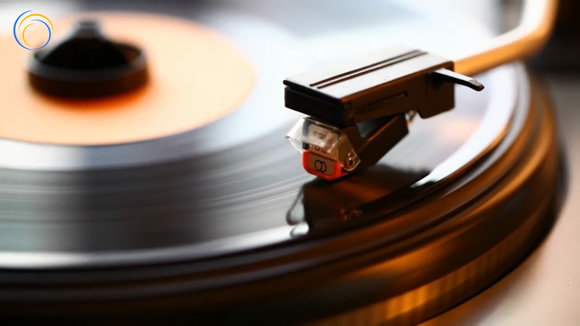 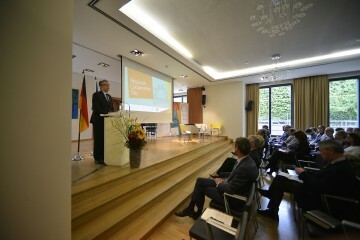 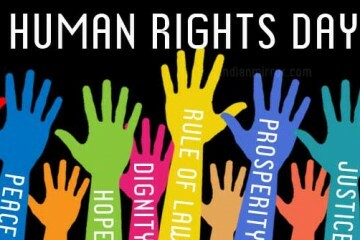 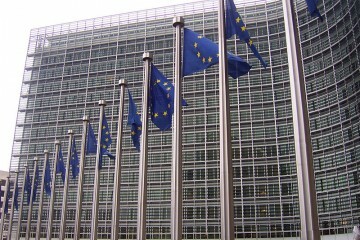 It also approved the Secretary General’s financial report for 2011. 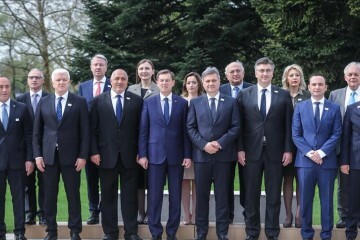 In a Joint Statement adopted in Budva today, Ministers of Defense of the South-East European Cooperation Process (SEECP) stressed the importance of defense and security cooperation in fostering general stability and development in the region. 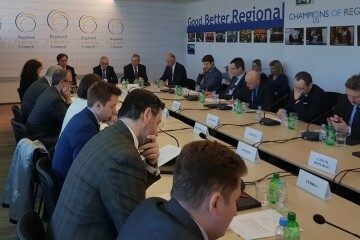 The Board of the Regional Cooperation Council (RCC) met in Sarajevo today to review the activities of the organization over the past three months and provide guidance for the period ahead. 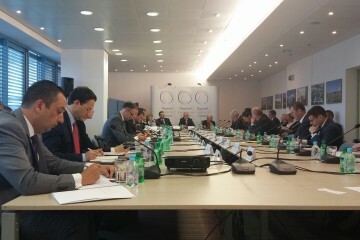 During a visit to Sarajevo today, the EU High Representative for the Common Foreign and Security Policy, Javier Solana, met with the RCC Secretary General, Hido Biscevic, to reiterate EU support to RCC activities. 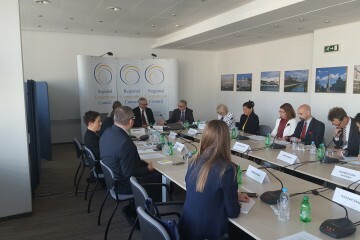 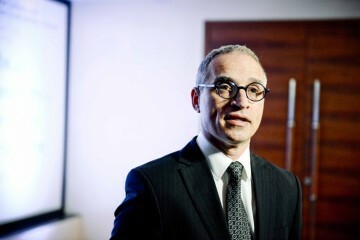 Within regular consultations with the EU Presidency, the RCC Secretary General, Hido Biscevic, met today with the First Czech Deputy Foreign Minister, Tomas Pojar, to discuss current situation in South East Europe (SEE) and cooperation between the RCC and the Presidency. 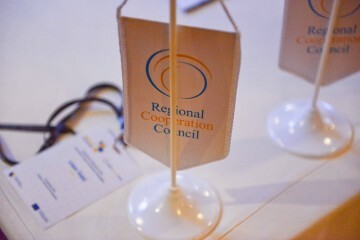 National Coordinators from RCC members from South East Europe (SEE) held their first meeting in 2009 in Sarajevo today, to discuss the most recent RCC activities. 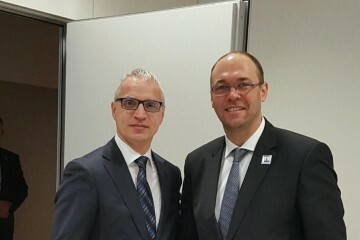 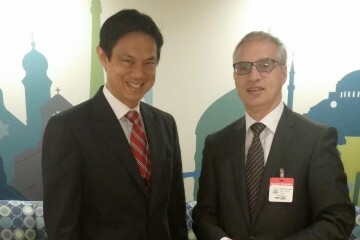 The RCC Secretary General, Hido Biscevic, met today the Chairman of the Council of Ministers of Bosnia and Herzegovina, Nikola Spiric, to discuss investment possibilities in South East Europe. 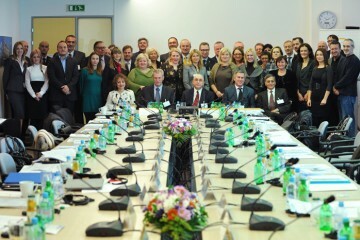 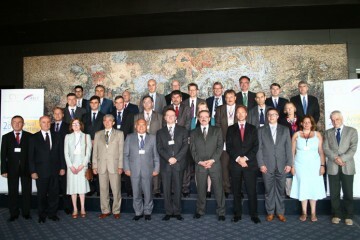 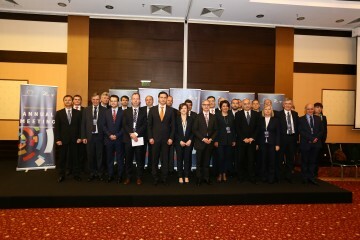 The RCC Secretary General Hido Biscevic participated at the 16th Ministerial Council Meeting of the Organisation for Security and Cooperation in Europe (OSCE) that took place in Helsinki on 4-5 December 2008. 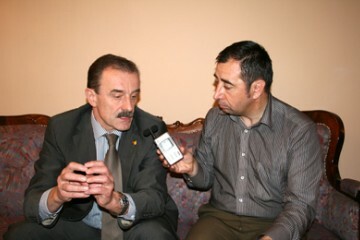 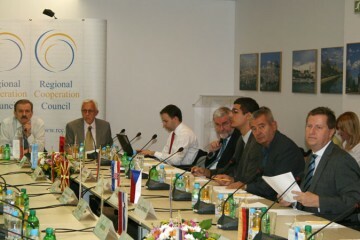 The RCC Secretary General Hido Biscevic received support of the Irish Government to the work of the RCC Secretariat at a consultative meeting held with representatives of the Irish Department of Foreign Affairs on 20 November 2008. 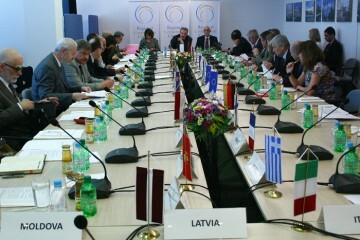 The 29 members of the RCC Board met for the first time at the premises of the RCC Secretariat in Sarajevo on 6 October 2008.